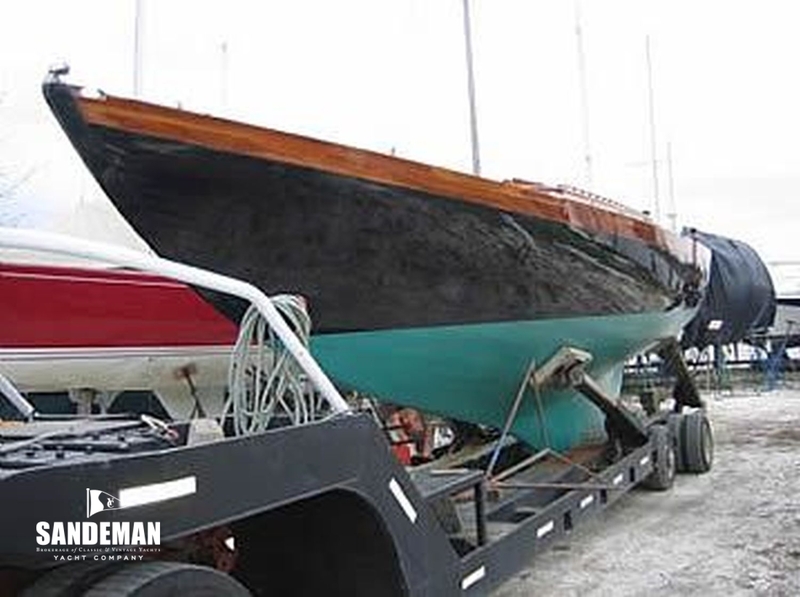 In a taped interview in 1975 Sid Herreshoff spoke of the origins of the class being derived from the Newport 29 design and an improvement on ALERION III. 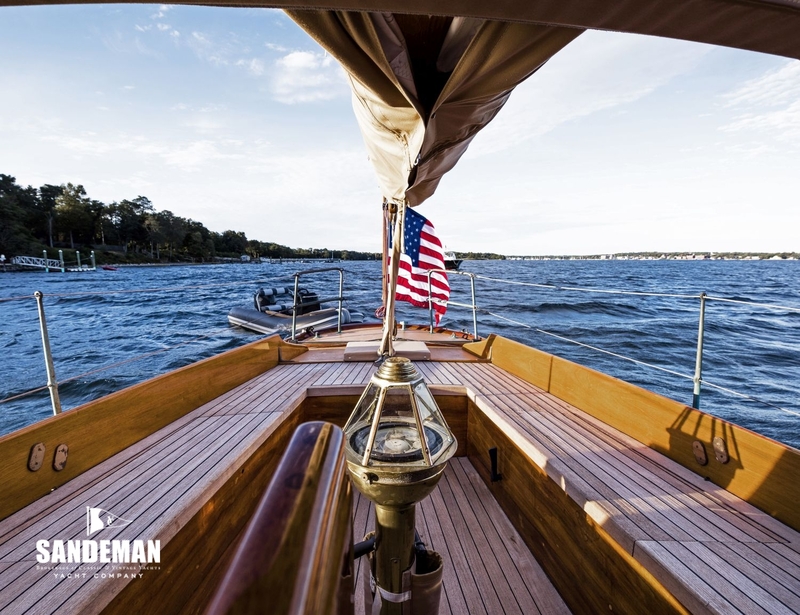 Then Herreshoff’s original marketing claimed”....the boats are the result of years of careful study to develop a model which is exceptionally sturdy, seaworthy and dry in rough going........! 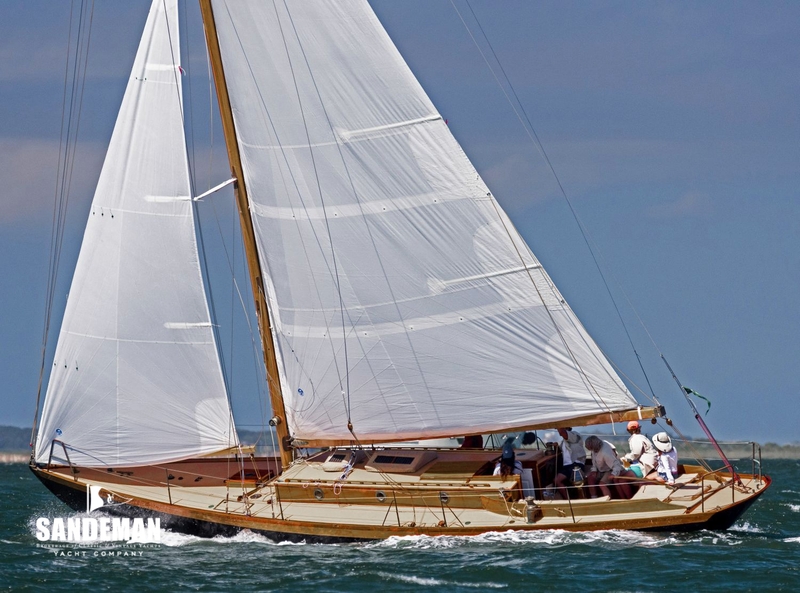 KESTREL and her sisters have not disappointed and this special boat has been rewarded by a recent careful ownership and restoration. 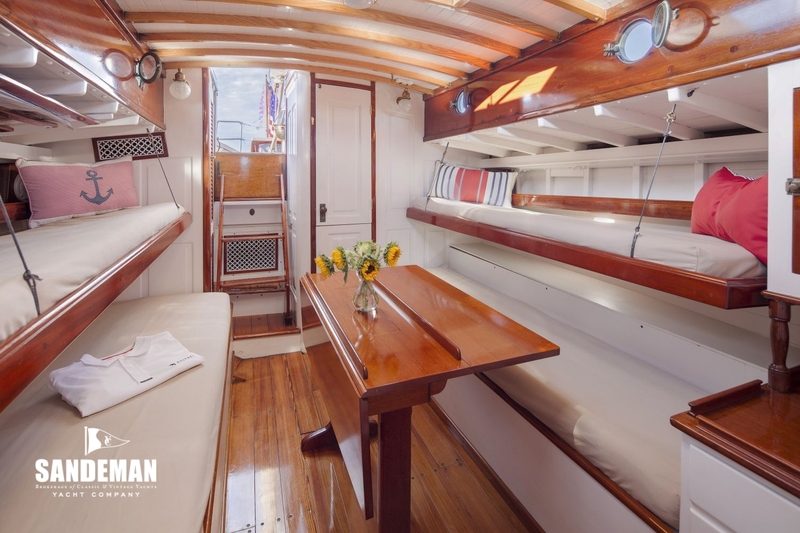 This design can be pushed hard around the classic regatta circuit yet with her generous cockpit and comfortable interior, she will cruise with the kids and probably with less fuss than many a modern boat. 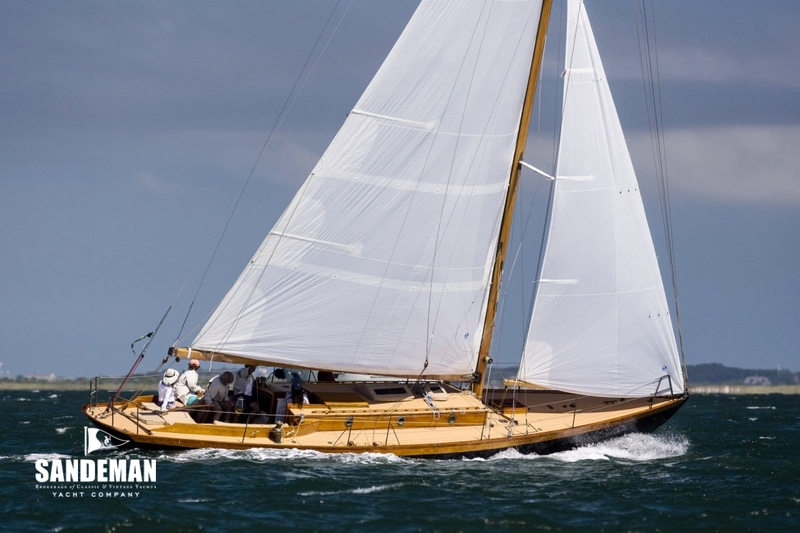 In the 1990s under the ownership of Geoffrey Davis; Narrangansett Shipwrights led by the late Frank McCaffrey restored KESTREL. 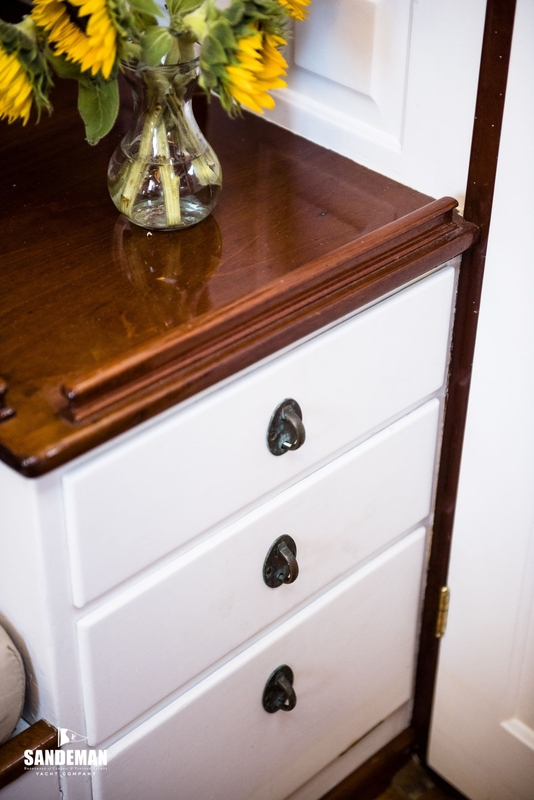 The major works involved replacing many of the frames, planking and deck as well as updating systems. 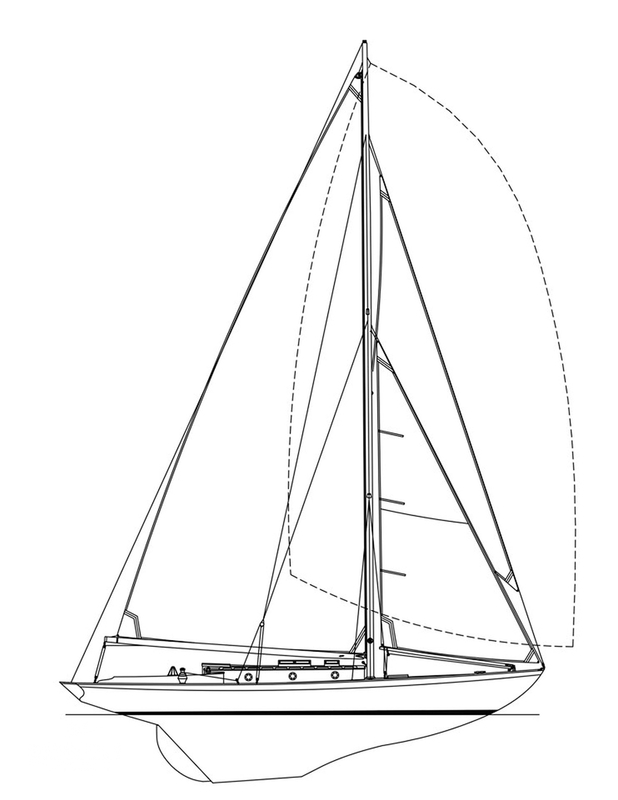 At that time the boat was re rigged to a fractional sloop rig designed by Halsy Herreshoff and based on one of the later Herreshoff Mfg Co sail plans, giving the boat slightly more sail than the earlier plans which were deliberately slightly undersized. The rig – and all spars of carbon fibre was built by Hall Spars; one of the early forays into the use of carbon fibre technology. 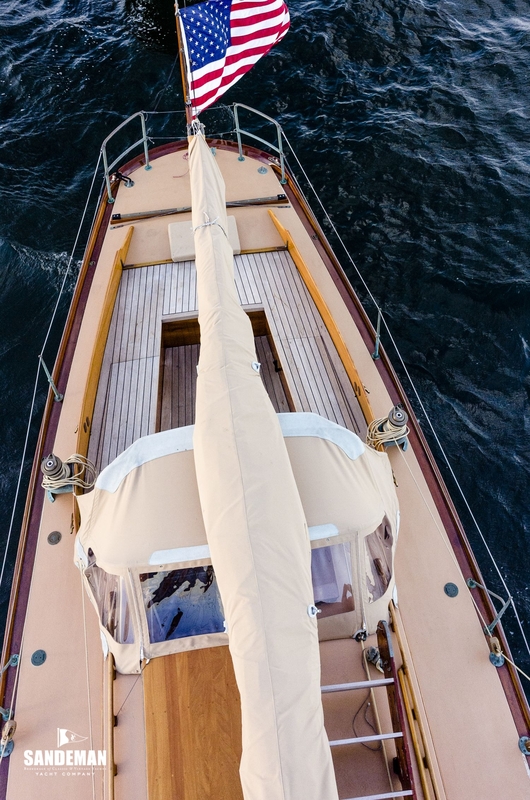 In the more recent refit, Angus decided to replace her Hall carbon fibre spars with new spars made of Sitka spruce – so of similar construction to those originally fabricated by Herreshoff in 1927. The team of Mt. Hope Boatworks (Jim Titus) and East Passage Boatwrights (Seth Hagan & Carter Richardson) collaborated on the construction of new spars, with naval architecture by Matt Smith. 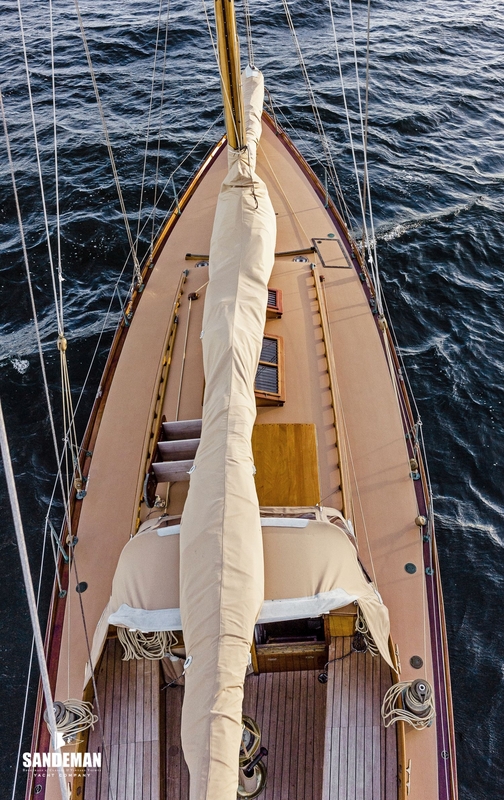 The wood mast is lightly built with eight staves of Sitka spruce; only 34 pounds heavier than the carbon mast built by Hall Spars in the mid 1990s. Hall Spars again however provided standing rigging, this time with more traditional construction technique. 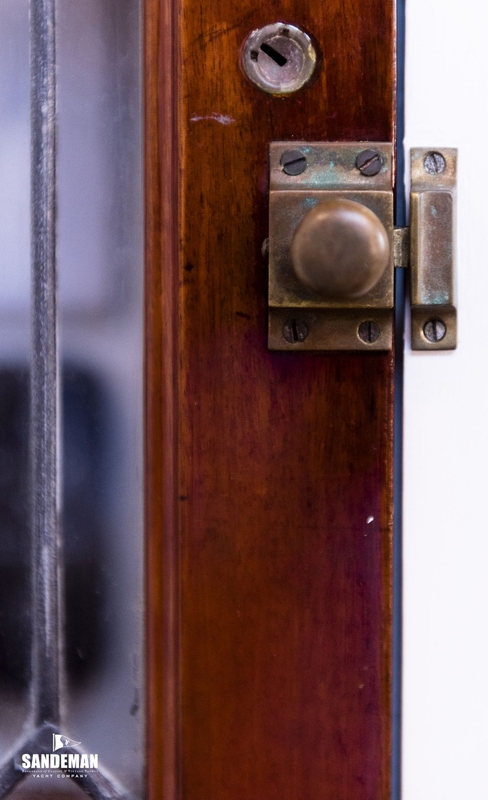 While KESTREL was built in 1927 she was not delivered to her owner until 1929, being given that year of build in the Hereshof Mfg Co order book. The Company built only 14 of these Fisher Island 31s, which have nonetheless been widely recognised as among the greatest ever all-round yacht designs. 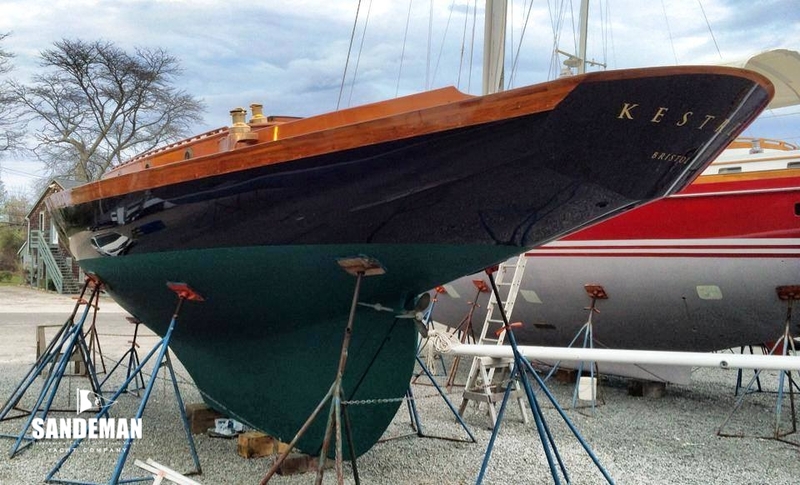 One of KESTREL’s sisters is the featured exhibit in the Herreshoff Marine Museum and various of the FI 31s have been the subject of article featured in the yachting press; notably “Wooden Boat”. 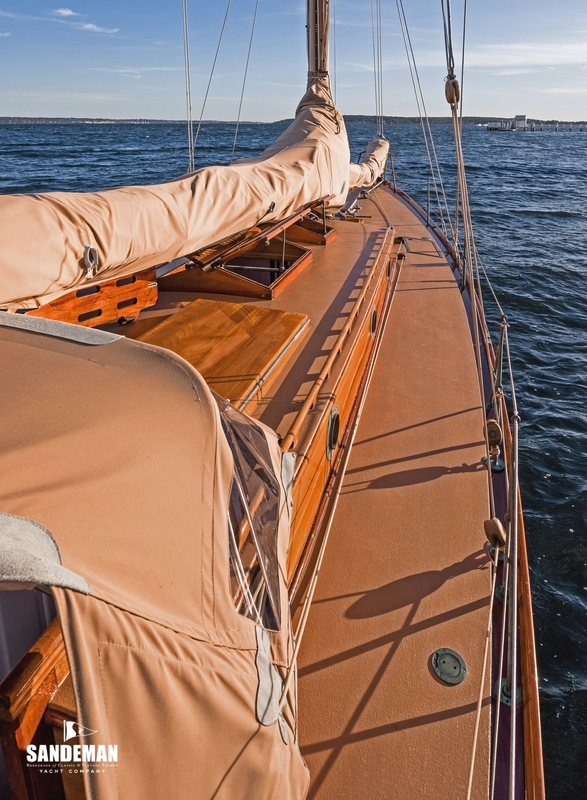 Having restored KESTREL in the 1990s at Narrangansett Shipwrights, her owner Geoffrey Davis went on to campaign the boat - with care provided by Bristol, RI's Lars Guck. 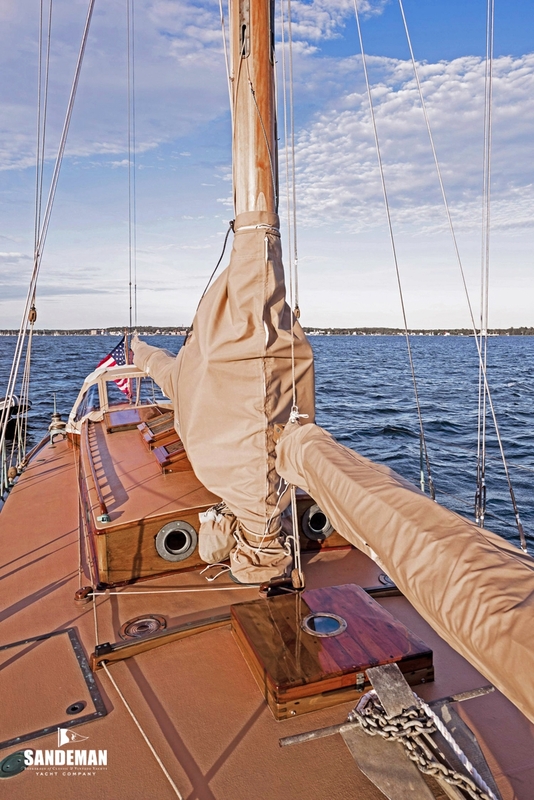 In 2009 Davis donated KESTREL to the Herreshoff Marine Museum, where she became the Museum's flagship yacht for use in educational programs and promoting the mission of the Museum. Under the care of HMM's Richard Feeny, KESTREL took children around the northeast from all walks of life for sailing adventures. 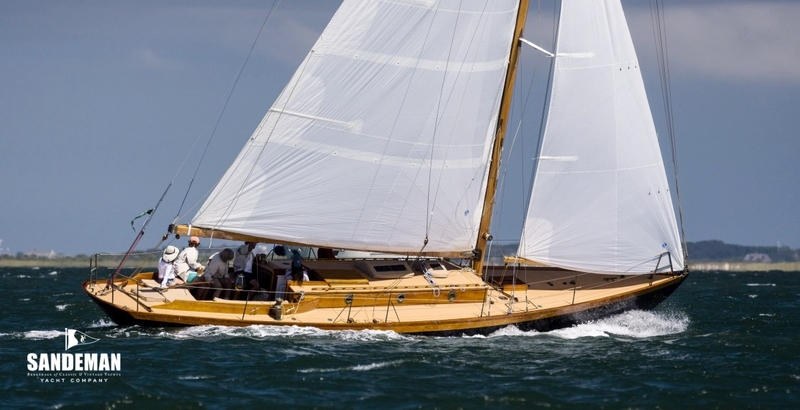 In 2013, the Herreshoff musuem decided to sell KESTREL, and the Davis family agreed to buy her back, with Geoffrey's son Angus taking the lead this time with a major refit also carried out Narrangansett Shipwrights. 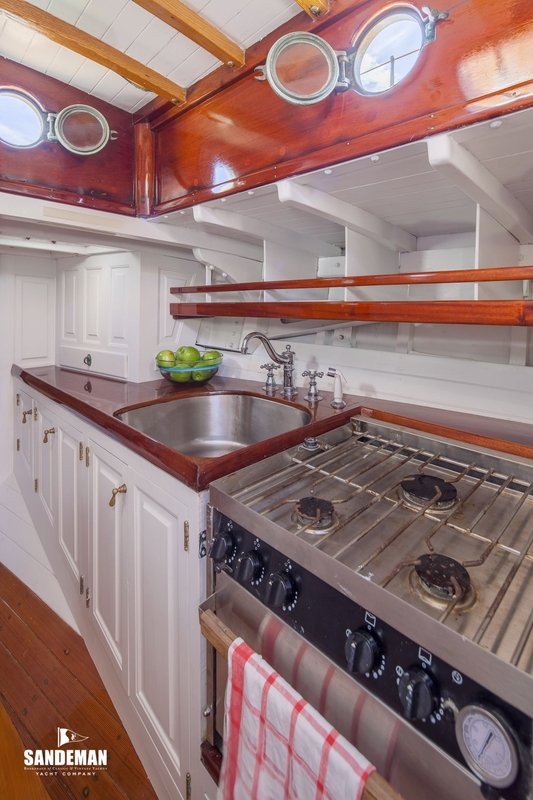 Notwithstanding the restoration in the 1990s and substantial recent refit; KESTREL remains highly original. 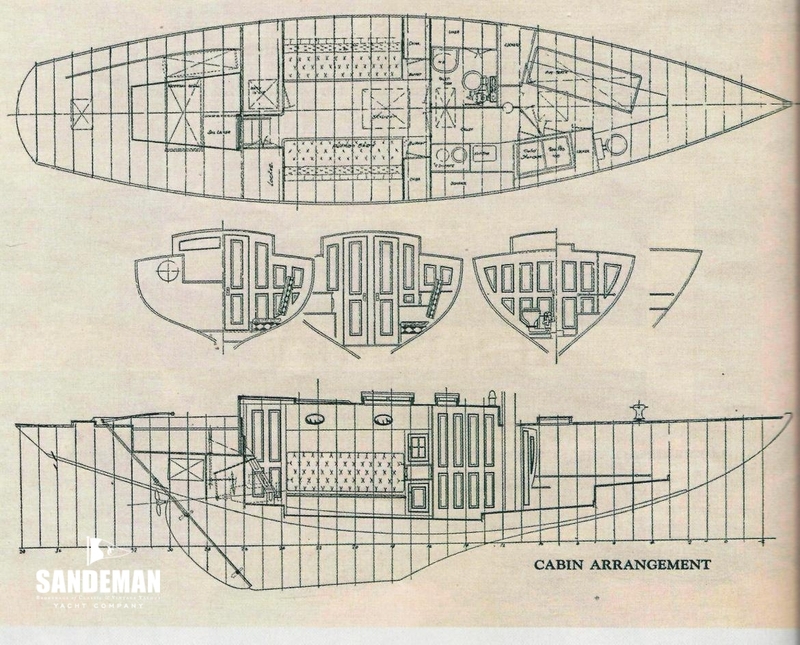 She retains her original main cabin layout and an extraordinary amount of original joinery detail. 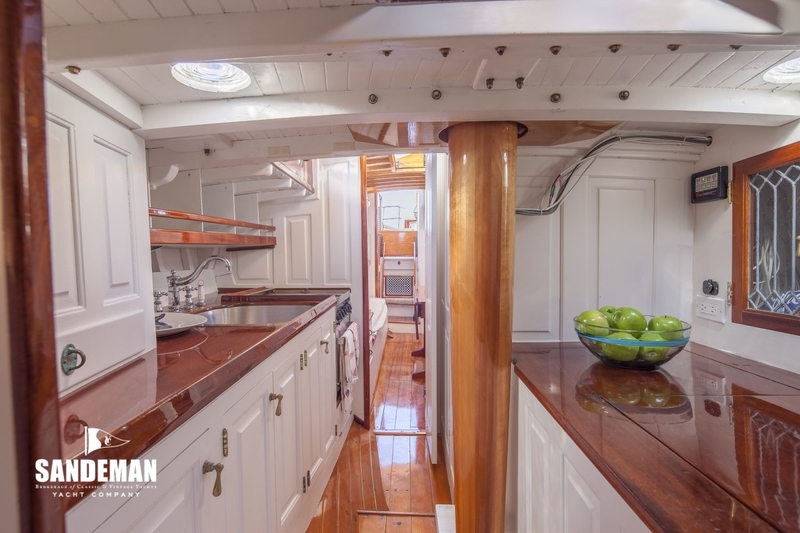 This includes the main cabin panelling, cabinetry, leaded glass doors, etc. 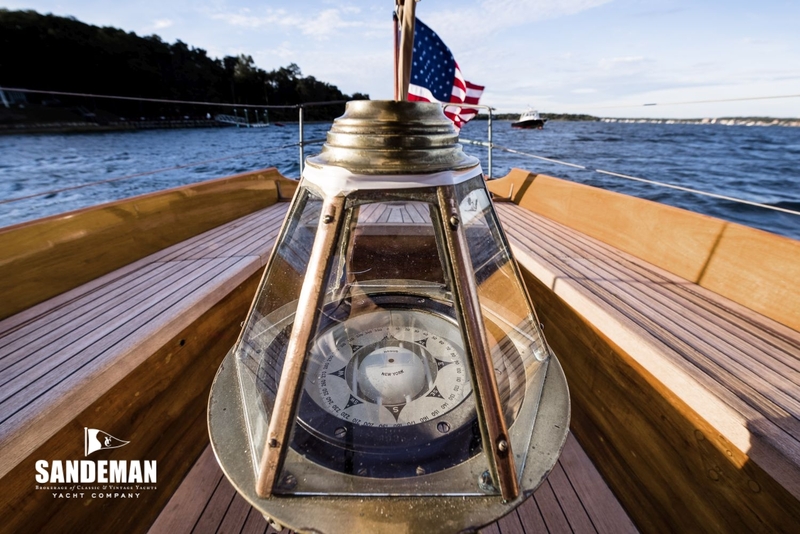 She still has the original Herreshoff steering compass and binnacle. On deck there are two of the original skylights, all of the hatches as well as the opening cabin ports. 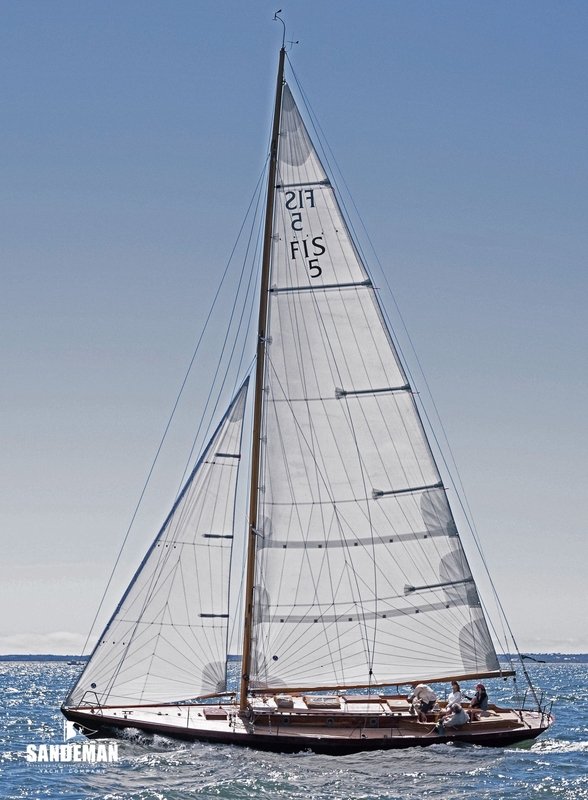 The Fisher's Island 31 Footer Class dates back to 1926, when Barklie Henry contracted the first one, but earlier Herreshoff designs are the basis for the class. 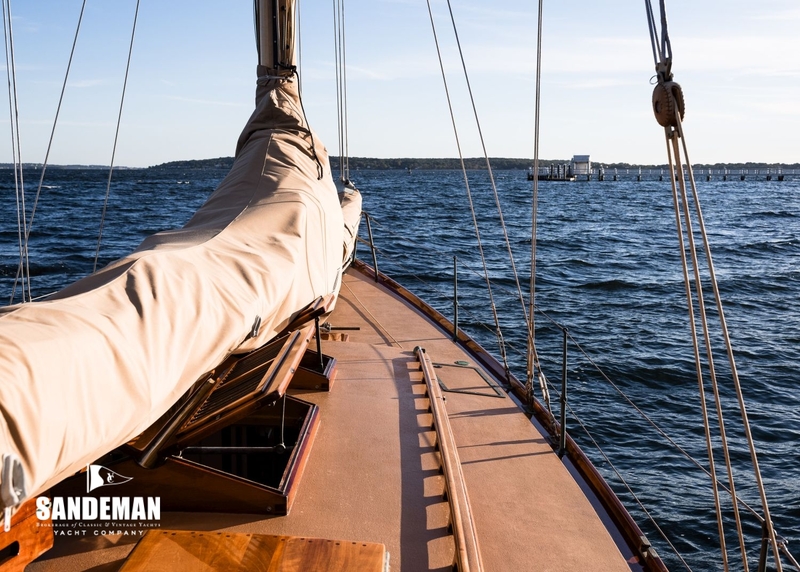 Indeed it is based directly on Captain Nat Herreshoff's famous half-model for his own well-known boat, ALERION, now on display at Mystic Seaport, and which design is still built to this day. 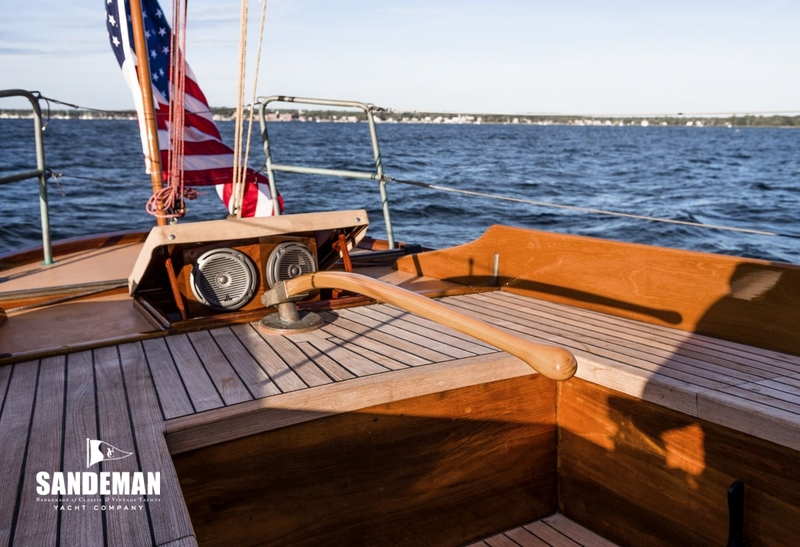 This same half model was used for the Newport 29s and influenced such other outstanding Herreshoff hollow bow designs as the Buzzards Bay 25. Lines for the FI 31s were laid out by Nat's son Sidney and resulted in an exceptionally dry, comfortable boat with reasonable cruising accommodation. 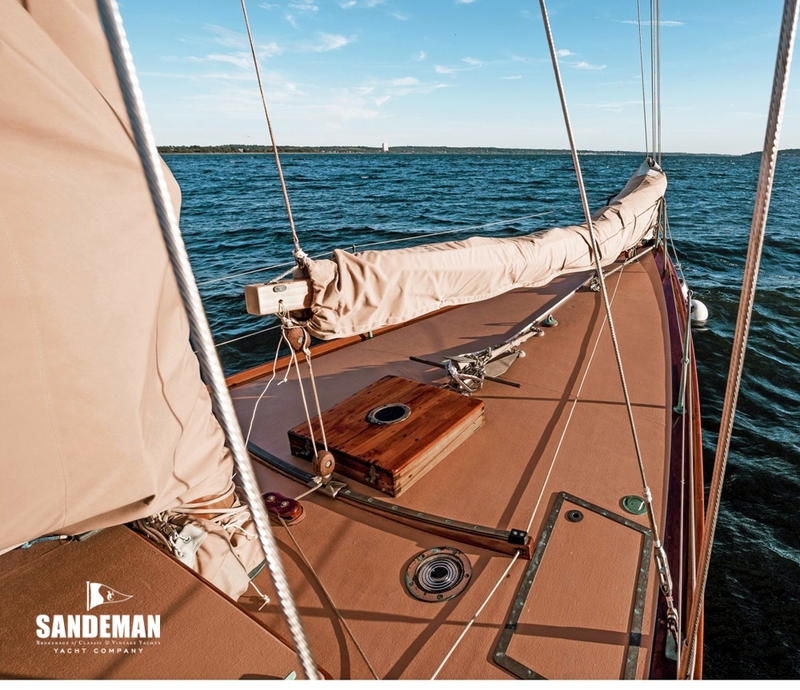 Knowledgeable commentators from Waldo Howland (whose first major brokerage project for Concordia consisted of the purchase and refitting of six FI 31s) to Maynard Bray have consistently praised the FI 31s as exceptional boats. KESTREL's sister ship, PATAPSCO II, completed a circumnavigation. KESTREL herself during her long and caring ownership by the Tarbell family completed most of the major northeast ocean races including Halifax and Bermuda. 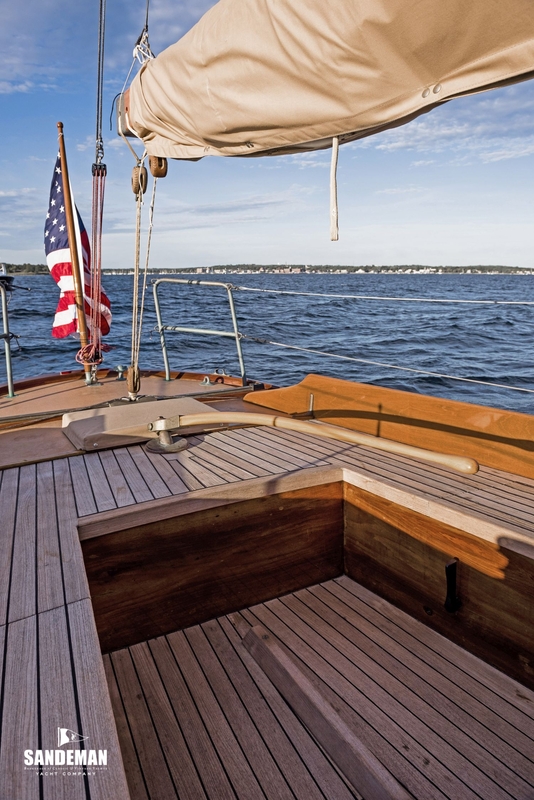 KESTREL's sister ship, CIRRUS, re-rigged as a yawl by Joel White for her then owner Alan Bemis, is featured in Benjamin Mendlowitz's famous coffee table book, "Wooden Boats." There has always been discussion on to whom the credit should be given for this design. In a taped interview with Maynard Bray and Barry Thomas on October is, 1975, Sid Herreshoff spoke of the origins of the class when discussing the alterations to the ALERION III model designed by Captain Nat Herreshoff. 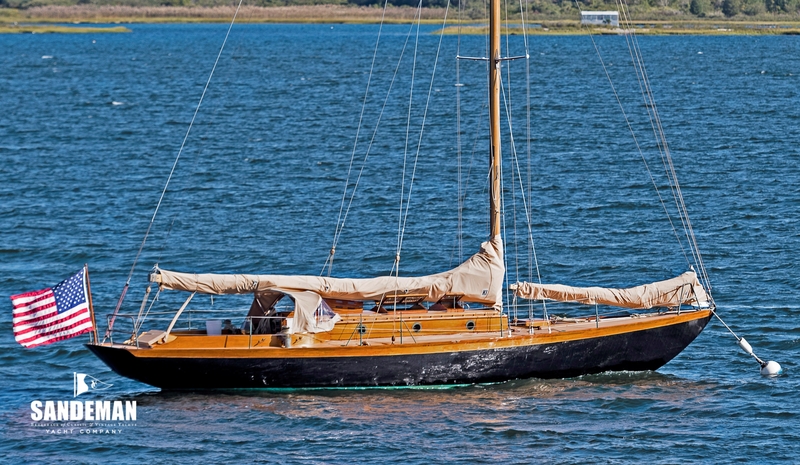 Sid explained that the lines of the Fisher's Island 31s were derived from the Newport 29 class, a keel version of SADIE, which was a 1914 improvement on ALERION IlI. 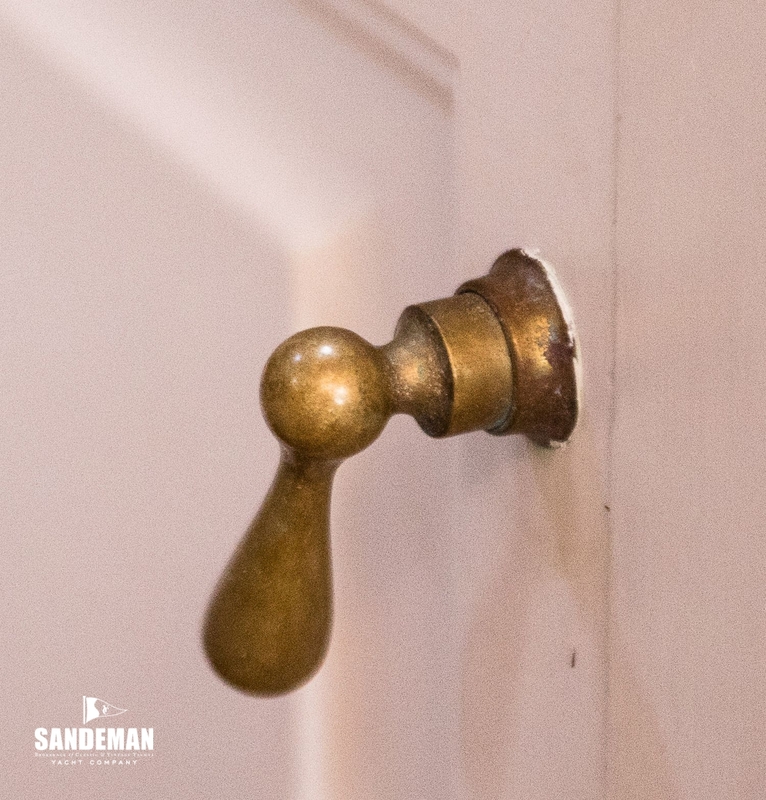 When asked whether the same model was used for the Fisher's Island 31s, Sid responded; “Yes - but the ends were doctored, some in the overhangs both forward and aft.” He also added that the lead was further down, making the 31 a little deeper. To Thomas' remark “The Fisher's Island 31 profile was changed quite a bit. She's quite a bit longer on deck,” Sid Herreshoff replied, “The Fisher's Island 31 Footers were designed when my father was away. I was the one who laid down the boat.” The credit for the design must therefore be shared by the father and son team of Nat and Sid Herreshoff with the lion's share of it going to the son. 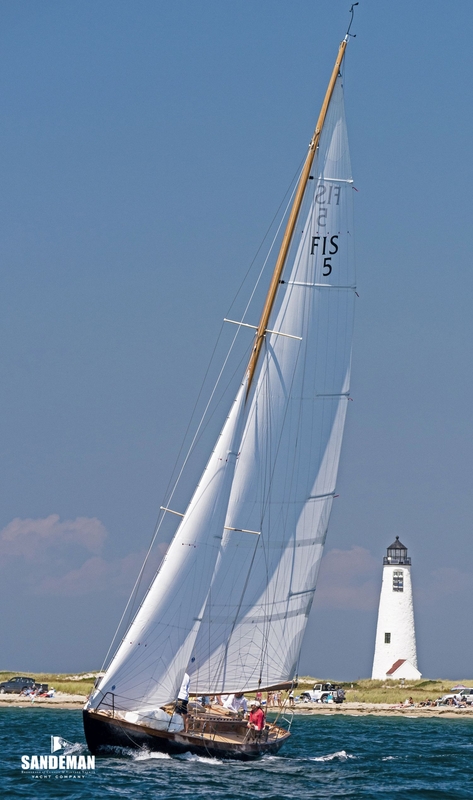 (Some text in this paragraph is reproduced from that by the display of TORCH ex SAVAGE #1153, another Fishers Island 31 currently at the Herreshoff Marine Museum in Bristol, RI). 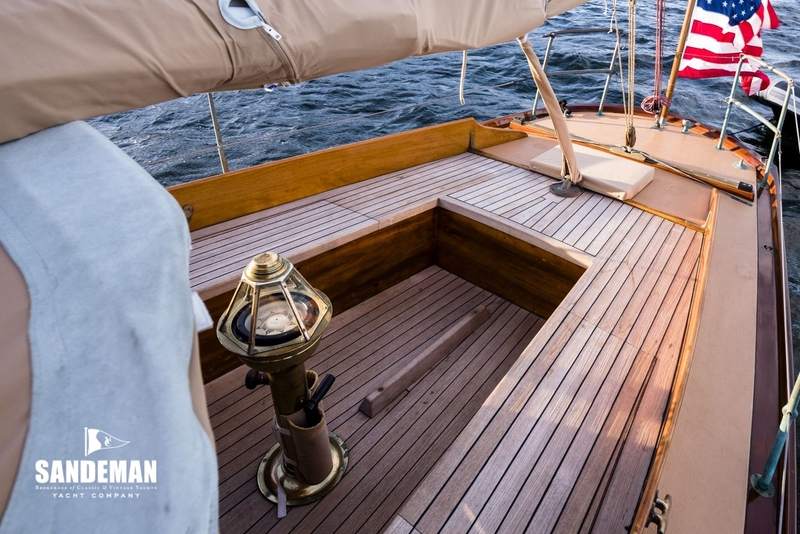 These boats are the result of years of careful study to develop a model which is exceptionally sturdy and seaworthy and dry in rough going, without sacrificing the element of speed which is so much to be desired in a sail boat. 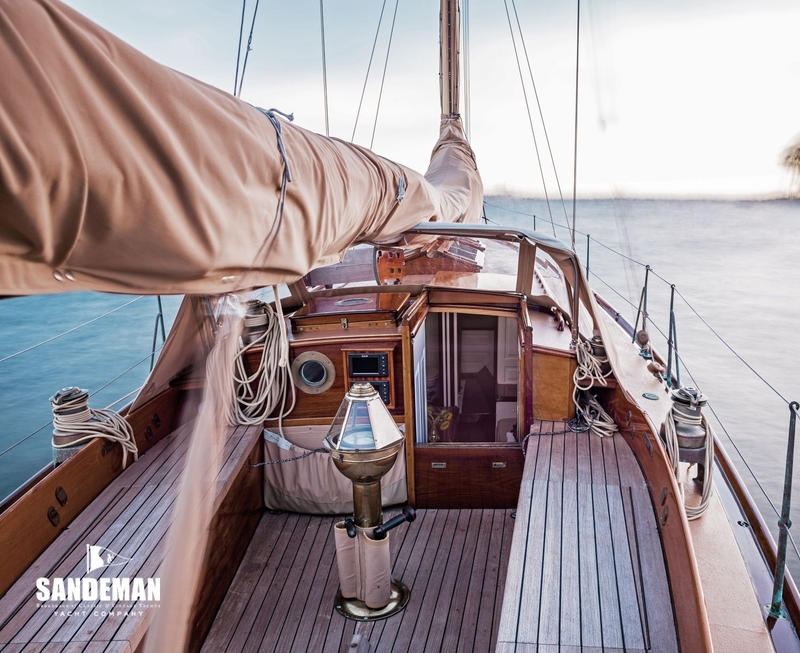 The forward section is sharp enough to prevent pounding under any condition, and is sufficiently flaring to prevent the boat from throwing water even when being driven hard to windward in rough weather. 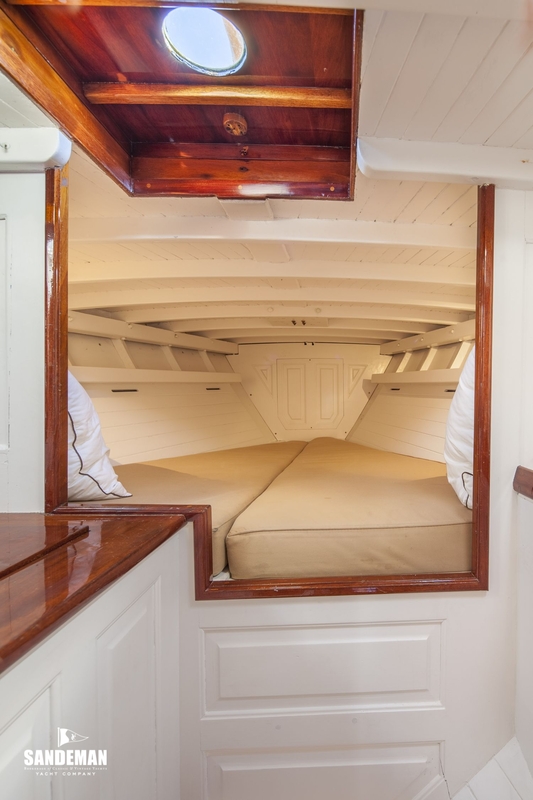 They are large enough to give head room and elbow room and plenty of storage space for cruising equipment and accommodation, and yet are rigged with a conservative sail plan so that one man can get the boat under way and put it up under any weather conditions without it being a hardship. 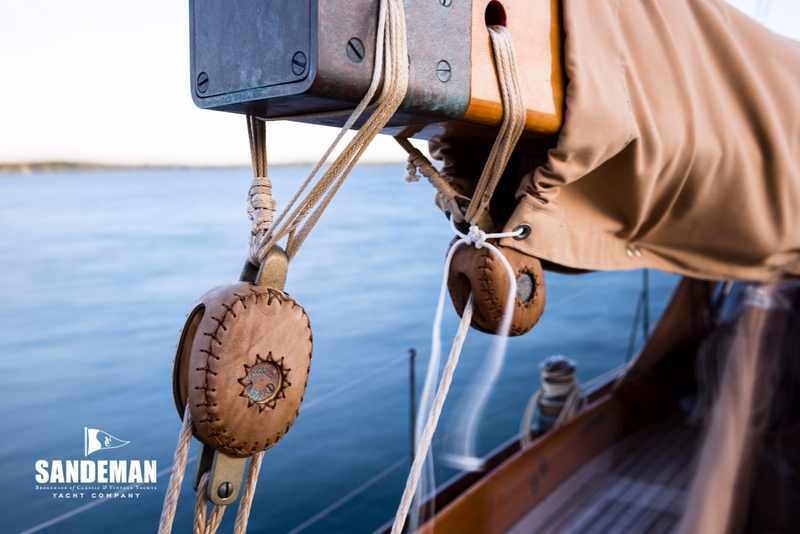 While every care and precaution has been taken to make these boats as able, seaworthy and pleasant handling as is possible under bad weather conditions, equal provision has been made to prevent loss of speed under sail. 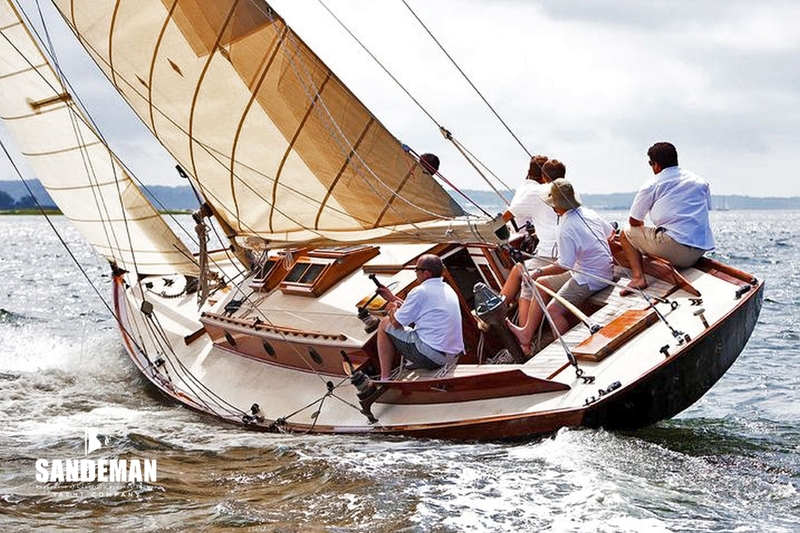 Their performances in the New York Yacht Club runs and in the 1929 Gibson Island race have clearly demonstrated their ability.